$1000 Amazon Gift Card is reserved for you is the PUP that uses misleading techniques to prevent removal. Use Reimage to locate malicious components and get rid of them faster than with uninstall instructions. A full system scan blocks virus reappearance and prevents traffic to malicious domains. Low. If PC's user ignores the pop-up, it can hardly cause any damage. However, if the PC's owner participates in a survey, he or she may unconsciously subscribe useless services and pay for it monthly or start receiving spam calls and messages. Continuous web browser's redirects to fake Amazon websites, pop-ups reporting a $1000 Amazon Gift Card giveaway, an excessive amount of commercial pop-ups. $1000 Amazon Gift Card virus has mostly been spreading on Mac OS X, but it can occur on Windows on the same frequency. Unfortunately, neither of the web browsers on the market (Google Chrome, Safari, Mozilla Firefox, Internet Explorer, Opera, etc.) is immune to this scam. 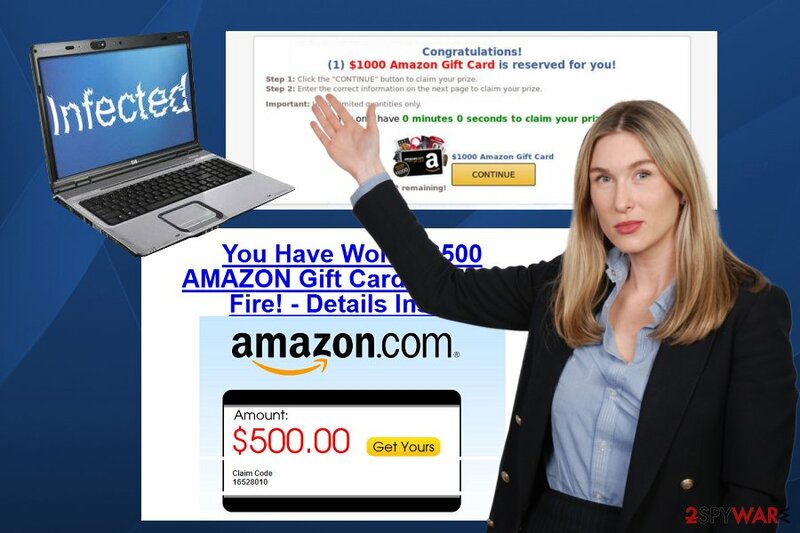 Typically, the $1000 Amazon Gift Card scam infiltrates PCs via freeware and injects third-party web browser's extension, which starts displaying fake Amazon prize giveaway pop-ups. As soon as this PUP gets victim's attention, he or she is asked to click the “Continue” button. After doing so, the user is redirected to a “Quick Survey” window, which asks to indicate the phone number, name, home address, email address and other sensitive information. The potential victim is also informed about the decreasing number of “remaining prizes” and similar information. That's a psychological strategy used by criminals to raise people's interest and involve them in the scam affair. 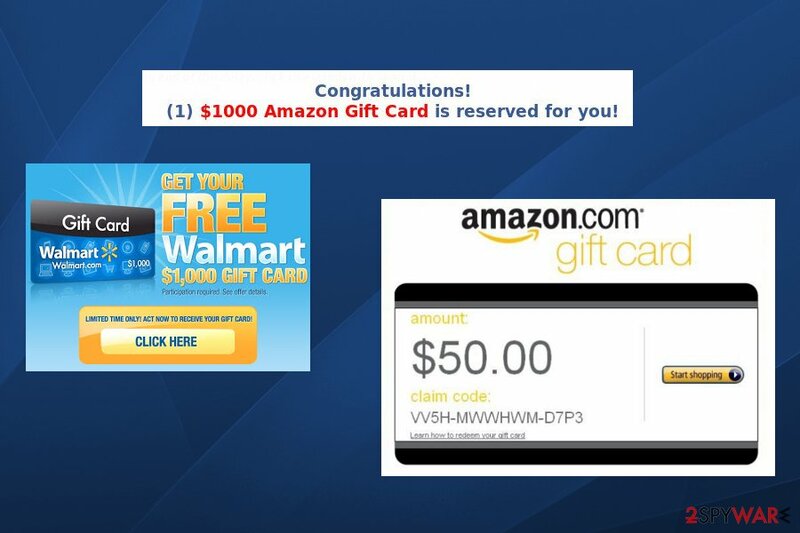 Unfortunately, the “$1000 Amazon Gift Card is reserved for you” virus has nothing in common with Amazon. In fact, this American e-commerce and cloud computing company is not spreading gift cards worth $1000. In a nutshell, this scam is a result of your PC's infection. Thus, it won't stop from disrupting you during web browsing as long as you won't remove $1000 Amazon Gift Card related adware. For this purpose, we recommend scanning the system with Reimage or any other legitimate security software. We also recommend changing passwords and login information you use to connect to social networks. Displaying various ads, offers, banners, and pop-ups that all promote questionable content, including installers for various optimization utilities, fake updates, toolbars, tech support scams or similar. These tools are not legitimate. Instead, they can lead you to malware installation and other computer-related issues. Trying to install additional components, including browser helper objects and similar components without users’ consent. These objects are typically used to modify system settings, like DNS configuration, system files, security settings, etc., and prevent virus removal from the system. Collecting non-personally identifiable information which includes search queries, visited websites, IP addresses, and similar data. This data is used to generate customized ads and gain profit from it. 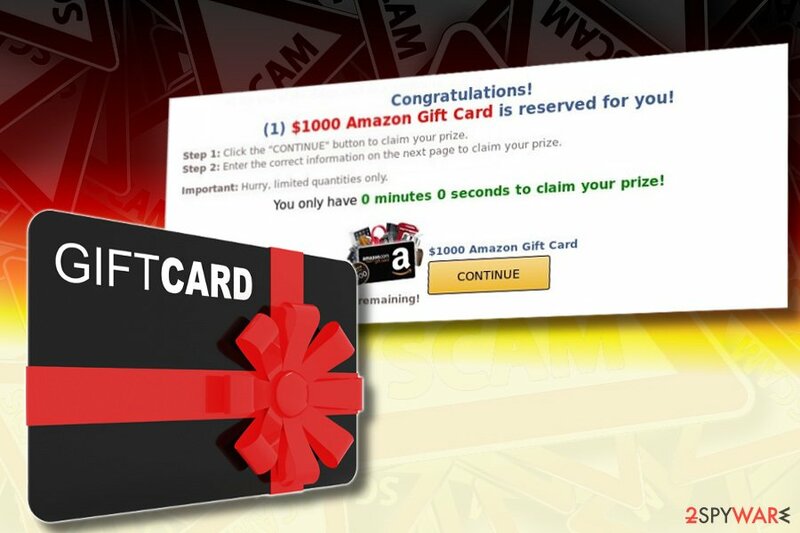 $1000 Amazon Gift Card scam is a tricky pop-up window, which attract attention of thousands PC users. However, you should be vigilant and stay away from deals that seem to be too good to be true. If you have been attacked by this fake Amazon-themed ad for a while, do not postpone its elimination. $1000 Amazon Gift Card is reserved for you removal consists of two procedures. First of all, it's a must to eliminate all suspicious and unknown entries from the system. You can do that both manually or automatically. For more information, please heed to the bottom of this article. Users are often not aware of the fact that adware-type programs can get into their computers without a clear permission asked. Fortunately, adware cannot affect the machine as seriously as other viruses. However, its ability to redirect users to questionable websites and data tracking cannot be ignored. To avoid unwanted programs on your computer, you need to keep away from third-party content and install only legitimate software. If you install free software, make sure you follow each installation step carefully and opt for the Advanced installation mode instead of Recommended one. Then, examine the list of optional programs presented to you during installation and uncheck everything you do not recognize. Adware can show up on your computer unexpectedly. Even if you are encountering this alert for some time, do not worry too much because it does not have a negative effect on your system. However, adding your personal information to its offered forms can be dangerous. To proceed with $1000 Amazon Gift Card removal, you need to find potentially unwanted programs on your computer. For that, you can either use anti-spyware software or try to find them manually. To help you with this procedure, security experts created a step-by-step guide which is presented below. However, please be careful and follow each step with care. Otherwise, the virus can reappear right after you reboot your computer. If you want to remove “$1000 Amazon Gift Card is reserved for you” adware without such issues, employ an anti-virus software. Be aware that security software you download from the Internet must be checked twice to avoid using fake applications that cause more trouble than help. Here, look for $1000 Amazon Gift Card is reserved for you or any other recently installed suspicious programs. Wait until you see Applications folder and look for $1000 Amazon Gift Card is reserved for you or any other suspicious programs on it. Now right click on every of such entries and select Move to Trash. When in the new window, check Delete personal settings and select Reset again to complete $1000 Amazon Gift Card is reserved for you removal. To uninstall this virus from Microsoft Edge, don't waste your time and reset this browser to its previous state. Once these steps are finished, $1000 Amazon Gift Card is reserved for you should be removed from your Microsoft Edge browser. Here, select $1000 Amazon Gift Card is reserved for you and other questionable plugins. Click Remove to delete these entries. Now you will see Reset Firefox to its default state message with Reset Firefox button. Click this button for several times and complete $1000 Amazon Gift Card is reserved for you removal. Here, select $1000 Amazon Gift Card is reserved for you and other malicious plugins and select trash icon to delete these entries. Click Reset to confirm this action and complete $1000 Amazon Gift Card is reserved for you removal. To get rid of $1000 Amazon Gift Card scam from Safari, make sure you remove suspicious extensions first. Then, reset this browser to its previous state by deleting history, cashed files and similar content. Here, select Extensions and look for $1000 Amazon Gift Card is reserved for you or other suspicious entries. Click on the Uninstall button to get rid each of them. Now you will see a detailed dialog window filled with reset options. All of those options are usually checked, but you can specify which of them you want to reset. Click the Reset button to complete $1000 Amazon Gift Card is reserved for you removal process. ^ John Smith. Watch out for scam surveys and fake gift card offers. ScamWatch Radar. ^ What is free software?. Wikipedia, the free encyclopedia. ^ Virus removal site. Latvian version. Viruss.lv. This entry was posted on 2018-05-15 at 06:41 and is filed under Adware, Viruses. You can quickly scan the QR code with your mobile device and have $1000 Amazon Gift Card is reserved for you manual removal instructions right in your pocket. How did you remove $1000 Amazon Gift Card is reserved for you?